Release notes for all versions of Setlist Helper for Apple devices. Setlist Helper is an app for musicians that need a reference to their song catalog. It is meant to replace your physical songbook. 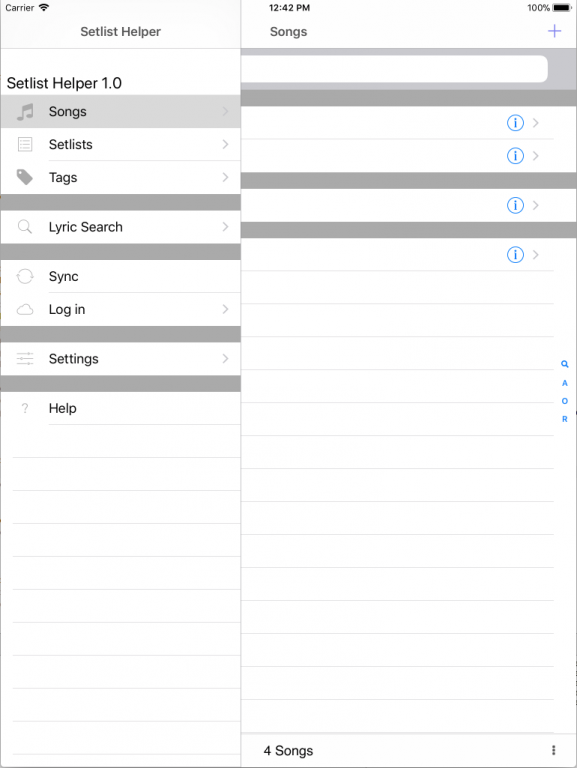 You can organize your songs into a setlist. Also, you can organize your lyrics by assigning Tags to songs such as Acoustic, Dance, Worship, etc… You can search for lyrics or add your own custom lyrics. The app should open with the “Home menu” open. To open the main menu tap the “< Home” button in the upper left. The home button will only appear if you are at one of the root level screens. Root level views are the first view that appears when you tap one of the menu items shown below. Sync – Allows you to backup your data to www.setlisthelper.com. Settings – Change the settings in the app such as Dark Theme, Show/Hide song attributes in the list. Showing song attributes on the song list. Importing and Exporting your song list. Updating and Downloading Dropbox Files. What are tags? Adding, editing or deleting tags.